A common computer input device, a keyboard. 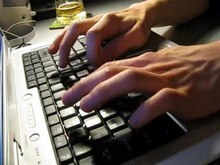 A user presses a key which transfers information to a computer. In computing, an input device is a piece of computer hardware equipment used to provide data and control signals to an information processing system such as a computer or information appliance. Examples of input devices include keyboards, mouse, scanners, digital cameras and joysticks. Audio input devices may be used for purposes including speech recognition. Many companies are utilizing speech recognition to help assist users to use their device(s). 'Keyboards' are a human interface device which is represented as a layout of buttons. Each button, or key, can be used to either input a linguistic character to a computer, or to call upon a particular function of the computer. They act as the main text entry interface for most users. Traditional keyboards use spring-based buttons, though newer variations employ virtual keys, or even projected keyboards. It is typewriter like device composed of a matrix of switches.There also happens to be another keyboard that is like an input device for musical instrument which helps to produce sound. Pointing devices are the most commonly used input devices today. A pointing device is any human interface device that allows a user to input spatial data to a computer. In the case of mouse and touchpads, this is usually achieved by detecting movement across a physical surface. Analog devices, such as 3D mice, joysticks, or pointing sticks, function by reporting their angle of deflection. Movements of the pointing device are echoed on the screen by movements of the pointer, creating a simple, intuitive way to navigate a computer's graphical user interface (GUI). Whether the input is direct or indirect. With direct input, the input space coincides with the display space, i.e. pointing is done in the space where visual feedback or the pointer appears. Touchscreens and light pens involve direct input. Examples involving indirect input include the mouse and trackball. For pointing devices, direct input is almost necessarily absolute, but indirect input may be either absolute or relative. For example, digitizing graphics tablets that do not have an embedded screen involve indirect input and sense absolute positions and are often run in an absolute input mode, but they may also be set up to simulate a relative input mode like that of a touchpad, where the stylus or puck can be lifted and repositioned. Embeded LCD tablets which are also referred to as graphics tablet monitor is the extension of digitizing graphics tablets. It enables users to see the real-time positions via the screen while using. Some devices allow many continuous degrees of freedom as input. These can be used as pointing devices, but are generally used in ways that don't involve pointing to a location in space, such as the control of a camera angle while in 3D applications. These kinds of devices are typically used in virtual reality systems (CAVEs), where input that registers six degrees of freedom is required. Input devices, such as buttons and joysticks, can be combined on a single physical device that could be thought of as a composite device. Many gaming devices have controllers like this. Technically mice are composite devices, as they both track movement and provide buttons for clicking, but composite devices are generally considered to have more than two different forms of input. Video input devices are used to digitize images or video from the outside world into the computer. The information can be stored in a multitude of formats depending on the user's requirement. Audio input devices are used to capture sound. In some cases, an audio output device can be used as an input device, in order to capture produced sound. Audio input devices allow a user to send audio signals to a computer for processing, recording, or carrying out commands. Devices such as microphones allow users to speak to the computer in order to record a voice message or navigate software. Aside from recording, audio input devices are also used with speech recognition software. Punched cards and punched tapes were much used in the 20th century. A punched hole represented a one; its absence represented a zero. There were mechanical and optical readers.